3:00 PM: You will check-in Taj West End. Please note the registration and related cost is to be borne by you. 4:00 PM: Soothing stroll in the beautiful heritage gardens of the Taj. 5:00 PM: Tea and refreshments. 5:30 PM: There will be an orientation about The Golden Chariot and your journey. 6:00 PM: Performance of cultural dance. 6:45 PM: Krishna Darshan in ISKCON Temple (The International Society for Krishna Consciousness). 8:15 PM: The Golden Chariot will graciously welcome you at Yeshwanthpur railway station. 10:45 PM: Train departs to Chennai. 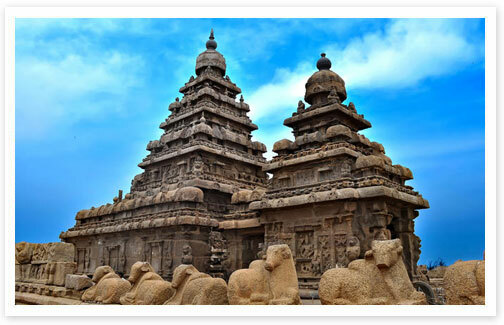 On your second day of the trip, after the breakfast aboard in Chennai, you will leave for Mamallapuram. Here Krishna's Butter Ball (A naturally formed rock along the hill-side, breaking the law of physics), Arjuna's Penance with beautiful carvings, Ganesha Temple, Caves and Five Rathas temple will be visited. 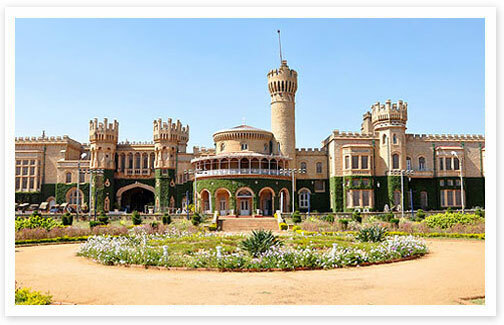 After the break and having lunch, you will go for sightseeing and darshan in Shore Shiva Temple and straight from here you will reach Puducherry station where the Golden Chariot awaits you for the dinner and over-night stay. 7:30 AM: Arrival at Chennai central railway station. 8:00 AM: Breakfast will be served on board, followed by a visit to San Thome Basilica and Museum. 10:00 AM: Leave by road for Mamallapuram. 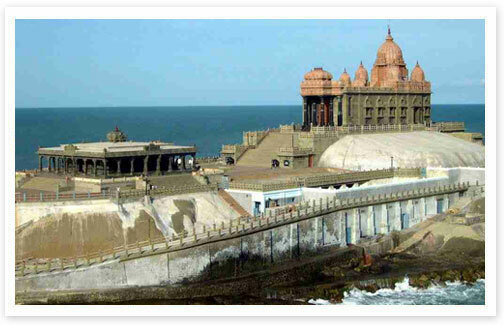 11:30 AM: Sight-seeing in Krishna's Butter Ball, Arjuna's Penance, Ganesha Temple, Caves, Five Rathas Temple. 1:30 PM: Lunch will be served in a luxury resort in Mahabalipuram. 3:00 PM: Sightseeing in Shore Shiva Temple and back to resort for tea and refreshments. 5:00 PM: Transfer by coach to destination station (Puducherry) to board Golden Chariot. 8:00 PM: 8:00PM: Dinner served on-board, followed by an overnight stay. 8:00 AM: Breakfast will be served on-board in the golden Chariot. 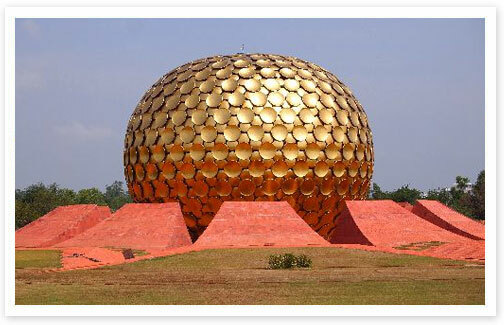 10:00 AM: Leave for sightseeing in Auroville Ashram where you can have darshan at Matra Mandri. 1:30 PM: Lunch will be served at a luxury 5 star resort in Puducherry. 3:45 PM: A visit to the Aurobindo ashram in the French town, Ganesha temple, shopping and stroll on the pristine Promenade beach. 6:30 PM: Back to the Golden Chariot. Freshen up and enjoy the amenities of your ride. 8:00 PM: Dinner on board. 11:30 PM: Train departs to Tanjavur. 7:30 AM: Arrival at Tanjavur railway station. 8:00 AM: Breakfast will be served. 10:00 AM: Darshan at Brihadeshwara Temple (a UNESCO World Heritage Site) and shopping in the emporium. 11:30 PM: Visit to the Chola Bronze Museum. 1:30 PM: Enjoy delicious lunch at Ideal River View Resort. 3:00 PM: Drive to Trichy by road. 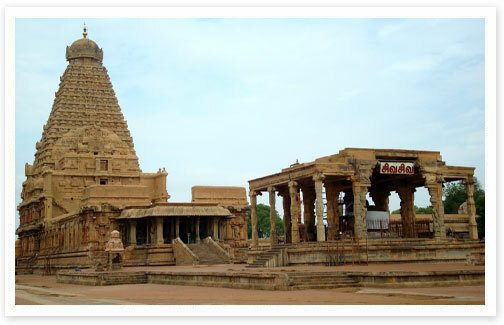 4:00 PM: Visit Sri Rangam temple in Trichy. 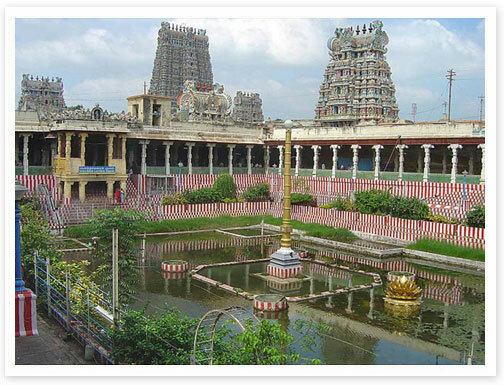 It is India's largest temple complex dedicated to Lord Vishnu. 6:30 PM: Return to Trichy railway station to board The Golden Chariot and refresh. 8:00: Appetizing Dinner is served on board. 12:15 AM: Train departs to Madurai. 5:15 AM: The Golden Chariot arrives in the Madurai Railway station. 8:00 AM: Breakfast will be served onboard. 10:00 AM: Darshan at the Madurai Meenakshi Sundareswarar Temple. 11:30 AM: Visit 1000 pillars temple and museum. 1:00 PM: Back to the chariot followed by lunch. 3:30 PM: Free time for shopping or rest on board The Golden Chariot. 6:00 PM: Visit the Thirumalai Nayakar palace for sound & light show. 8:00 PM: Back aboard and have scrumptious dinner in the train. 11:15 PM: The luxury Golden Chariot departs to Nagercoil(Kanyakumari). 3:45 AM: Arrive at Nagercoil railway station. 5:15 AM: Depart to Kanyakumari by road. Early risers can enjoy the ever-adored sunrise view. 7:30 AM: Back to the chariot as the breakfast gets served. 9:30 AM: Visit the Padmanabhapuram Wooden Palace. 1:00 PM: Back to the chariot as the lunch gets served. 4:00 PM: The Train reaches Kochuveli station. 4:30 PM: Drive to Kovalam. Enjoy the sunset, leisurely stroll. Tea and refreshments will be served in the beach. 7:30 PM: Cultural performance followed by dinner at a 5 star luxury resort, Kovalam. 10:00 PM: Back to the Chariot and soon the train leaves for Kochi. 4:30 AM: Golden Chariot departs for Alleppey. 8:00 AM: Enjoy scrumptious breakfast on board. 8:30 AM: The train arrives at the Alleppey Railway station. 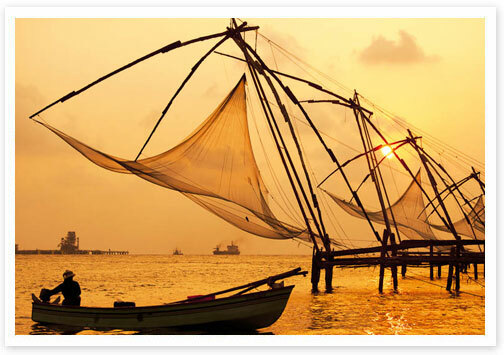 9:00 AM: Depart for Houseboat cruise on the Vembanad backwaters. 12:30 PM: Arrive at backwaters luxury resort for Lunch. 1:30 PM: Depart to Kochi by road. 3:45 PM: Visit the Chinese Fishing nets and a walk around the Jew town for shopping. 6:30 PM: Return to Ernakulum railway station to board The Golden Chariot. 7:30 PM: Train departs to Bangalore. 8:00 PM: Dinner on board The Golden Chariot. 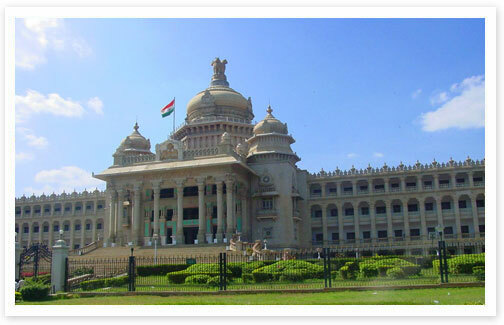 10:00 Am: The train reaches Bangalore and passengers will receive a warm farewell by the Golden Chariot team. Srirangam temple: This does not just have 'Rang' in its own name but the beautiful color scheme of this temple soothes the sight. The above mentioned tariff is valid for 2018 - 2018 departures. The above cost is exclusive of 5% service tax that will be charged extra .